The Global Switchboad's Digital Hub (analog version). Image courtesy of The Global Switchboard. Pick an issue of global importance — refugees, education, sustainable development, you name it. Chances are, somewhere in Pittsburgh, someone or something has vast expertise on the subject. 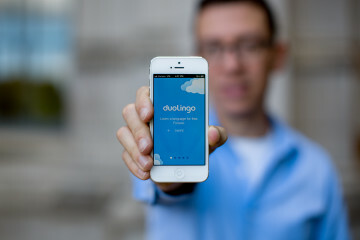 Between globally-oriented universities like Pitt and CMU, companies like language app giant Duolingo and nonprofits like Global Links, the knowledge is there. Finding it, though, can be a bit of a problem. But The Global Switchboard thinks they have the answer — a digital hub collecting all the information in one place. Though switchboards may seem archaic in a wireless world, the metaphor is apt for The Global Switchboard. 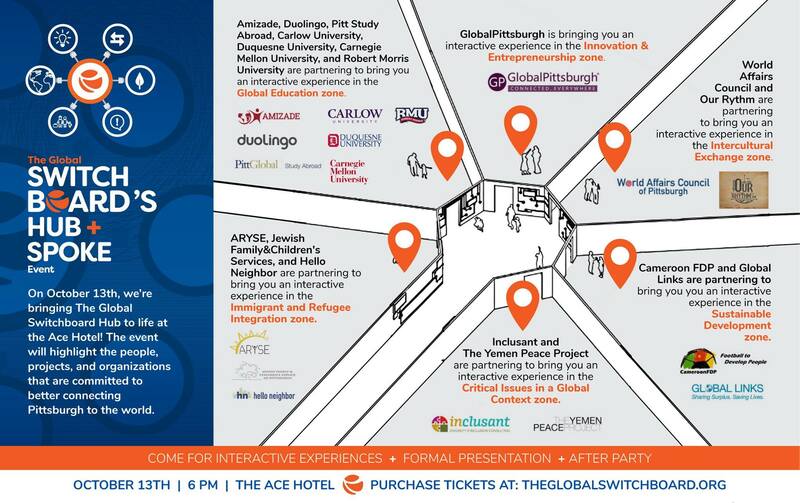 They literally make connections between the globally-oriented organizations in Pittsburgh that look beyond the boundaries of the three rivers into the wider world. Right now they’re known as a small co-working space in Lawrenceville where internationally-minded groups like Global Pittsburgh, Friends of Farmworkers, Building New Hope (fair trade coffee) and Amizade (global service learning) share space and resources. But that was never the endgame. So, they’re expanding their network virtually: They decided to build the Digital Hub, connecting the people, places and projects that are dedicated to better connecting Pittsburgh to the rest of the world. To best illustrate how this works to the general public, they’ll be turning the virtual hub prototype into a physical, analog experience on October 13 in the gym at the Ace Hotel in East Liberty. The gym will be divided into different zones, like Global Education — hosted by experts from Pitt Study Abroad, CMU and Duolingo, and others. The Immigrant and Refugee Integration Zone will be hosted by Jewish Family & Children’s Service, Hello Neighbor and others. And so on. The public is invited to try out this physical version of the Digital Hub, which is nearing completion. The official launch will be closer to the end of the year. This event is a fundraiser for the project, which will be “pay-what-you-can,” with a suggested donation of $40. Getting The Global Switchboard’s Digital Hub off the ground is a massive undertaking. It’s only supposed to be a start, though. “Once we’ve launched, we’re set up for our most important work — launching working groups to take on some of these bigger issues, like immigrant and refugee inclusion,” says Darity.